Home> Resource> iOS Transfer> How to Transfer Kindle Books to iPad Air, mini, the new iPad, etc.? "I used to read books on my Kindle in past years, but recently I purchased a new tablet PC iPad Air as my birthday gift. So I'm wondering is it possible to transfer books from my Kindle to iPad for better enjoyment?" Speaking of reading eBooks with your tablet, some people may prefer Kindle to iPad. But it is no doubt that iPad is also a good eBook reading device on the market, especially when the iPad mini comes to the market. Thus, it is inevitable that more and more users wish to find a way to read Kindle books on iPad, iPhone devices. So if you're also one of them, congratulations, you've been the right place. In this article, we'll show you different ways to transfer books from Kindle to iPad, you can compare them and decide which one is better according to your own needs. In recent years, lots of company have released their own apps in Apple's App Store, so does Amazon Kindle. Therefore, the distinctive way to read Kindle books on iPad is to install the iPad Kindle app and then log in with your Kindle account. After that, you can enjoy them on iPad without hassle. Below is the detailed steps for your reference. Step 1. Find and download the Kindle for iPad app in the Apple App Store, such as Amazon Kindle. Step 2. Then run it, here, you'll be required to fill out your Amazon login information in the related fields. After that, you can click "Register" button to log in the app. Step 3. In the Kindle for iPad's home screen, you can click "Archived Items" in the bottom of the panel, and then the list of all your Kindle books will be loaded and shown in the main scren. Finally select the books you wish to read, and download the book title to the home screen. After that, you can open the book for reading as you like. As it is known to all that Amazon Kindle and Apple's iPad have their own supported eBook formats, so generally speaking, when you transfer books from Kindle to iPad, you'll face the problem of format compatibility. So if you can solve the problem of format, then you can easily and quickly load Kindle books to iPad with iTunes by yourself. Step 1. Find an online or offline file conversion program to help you convert Kindle books to iPad supported ePub format. Here, you can use Zamzar online service to reach the goal. Step 2. Connect iPad to computer, and authorize it with iTunes. 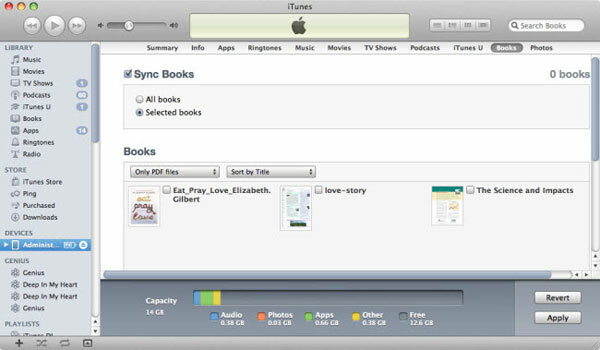 Click "File" > "Add File to Library" or "Add Folder to Library" to load the converted Kindle books to the iTunes library. After that, you can find your iPad under the option of "DEVICE" in the left panel, and then tap "Books" in the top menu, select "Sync Books" to import Kindle books to iPad without hassle. With the above methods, you can freely enjoy Kindle books on iPad as you like. And if you find there are so many books on your device and wish to backup them to your desktop computer, please don't hesitate to have a free trial on MobiKin Assistant for iOS (Free Version).